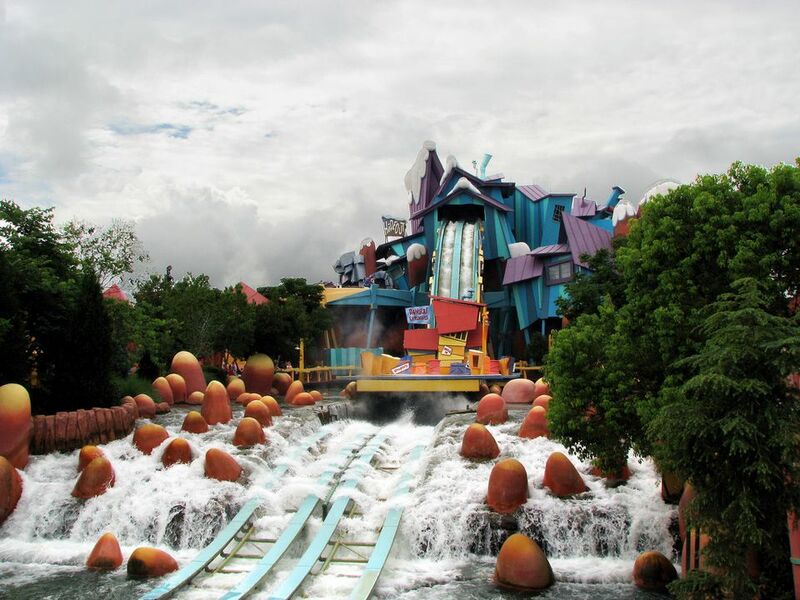 In Islands of Adventure, you can hop on a log at Dudley Do-Right's Ripsaw Falls for a fun-filled flume ride that delivers a 75-foot drop and actually plummets below the water level. Plan on getting soaked. Kids must be at least 44 inches tall to ride. The third in the trio of wet rides in Island of Adventure is Jurassic Park River Adventure, an indoor-outdoor water ride that features a harrowing escape from a T. rex when the raft takes an 85-foot plunge in darkness. Kids must be 42 inches tall to ride. If your little ones get hot and bothered in Islands of Adventure, bring them to Dr. Seuss Landing for playtime at If I Ran the Zoo. The animal-themed, interactive play zone includes a wet play area that keeps kids cool. Like walking through sprinklers? Strolling through the splash pads is an easy way to get quickly refreshed on a hot day. You'll find pop jets and fountains amid the shops and restaurants at Toon Lagoon in Islands of Adventure and on the way out of the parks at City Walk. Beat the heat at Universal Studios Florida with the help of everyone's favorite mischievous monkey and the waterplay attractions at Curious George Goes to Town. Take aim with your water cannon at the town center's clock tower and fill a pair of 500-gallon buckets that periodically dump water in a spectacular splash on the street below. While exploring the nooks and crannies in Diagon Alley (part of the Wizarding World of Harry Potter) in Universal Studios Florida, cool off with a sweet treat at Florean Fortescue's Ice-Cream Parlour, a magically quaint shop serving scoops and cones of soft-serve 'scream. Opened in 2017, Volcano Bay is a new tropical-themed water park anchored by a massive volcano. Attractions include a rapids ride, wave pool, lazy river, and different kinds of water slides.